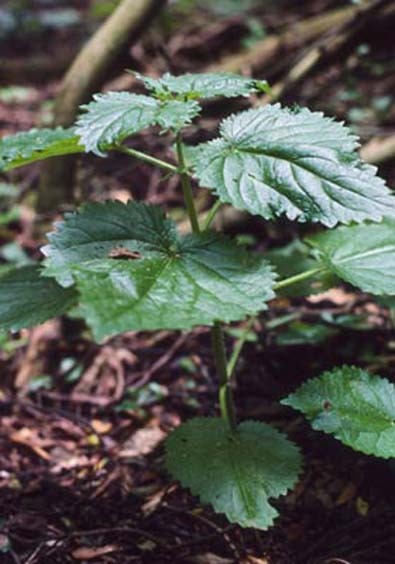 Laportea interrupta , "Nettle" (Urticaceae), and other stinging or sticky-leaved plants. From PROTO CENTRAL EASTERN PACIFIC *songa, "A biting insect". Wayan Fijian: Soga (Metroxylon vitiensis, "Fijian sago palm", Arecaceae). The word for this palm is listed in the Pollex database as cognate with the Polynesian words. It is possible that there is a real connection, as the trunk of the Soga palm is covered with "root spines" (modified roots which have been developed into protective armament by some plants, just as nettles have protective hairs modified into spines). 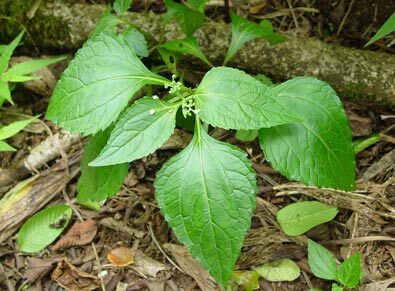 However, until the word reaches Aotearoa, in Polynesia it designates only herbs which are either nettles, have sticky surfaces, or have leaves resembling nettles. The ferocious New Zealand "tree nettle", Urtica ferox, a small shrub which can be up to 3 metres tall, is unmistakably a nettle; although the benign houhere, the other tree referred to occasionally as an ongaonga in Aotearoa, is a tree, it does not resemble a palm, and the link with the other ongaonga would seem to be its leaves and perhaps its winged fruit. As noted above, the Pollex database includes the Fijian name soga among the reflexes of the ancestral term denoting mainly nettles and other irritating plants in Polynesia. For this reason the reconstructed form in the Pollex database is *Hogahoga (*Hongohongo). It is possible that some early Polynesian explorer was indeed reminded of the palm with its prickly trunk when they named the herb with the irritating hairs (the reduplicated form the word takes in most Polynesian languages implies resemblance rather than identity), but since the final vowel in both Tongan and Samoan is "o", we have reconstructed the Proto-Polynesian form as *Hongohongo (*Hogohogo in the Pollex orthography). The Proto-Polynesian "h" is reflected only in Tongan and Niuean; elsewhere it has disappeared. In most places the reflexes of *Hongohongo refer primarly to nettles (botanical family Urticaceae), especially species of the widely-distributed tropical genus Laportea. 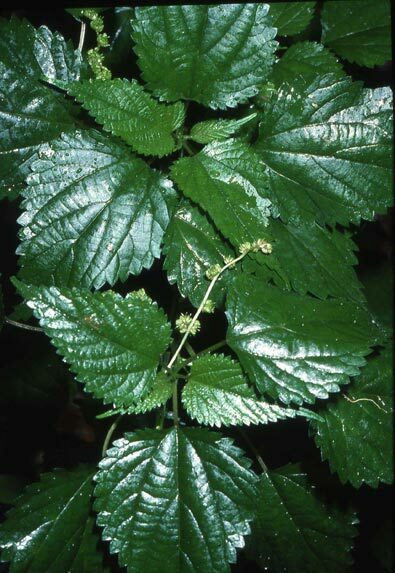 They may also refer to a plant with some nettle-like qualities -- a tendency to irritate or cling on to people who touch them, or having a leaf with serrated edges similar to those of a nettle. The Australian botanist Anthony Orchard ("A Review of Australian Adenostemma JR Forst & G Forst (Asteraceae: Eupatorieae" - see bibliography) reaches the conclusion that the the labels A. viscosum and A. lavenia in Australia and Polynesia are references to the same species, for which he adopts name A. lavenia. The Cook Islands database & Pollex retain the name A. viscosum; Karl Rensch & Arthur Whistler (Dictionary of Polynesian Plant Names) and Warren Wagner et al. (Manual of the Flowering Plants of Hawai'i) use A. lavenia. 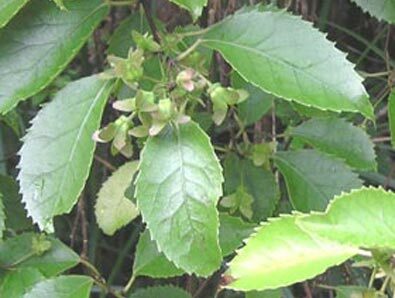 Further information : There is information about Ademostemma lavenia (A. viscosum) in the Bishop Museum Cook Islands database, and also the Australian Tropical Rainforest Plants database. 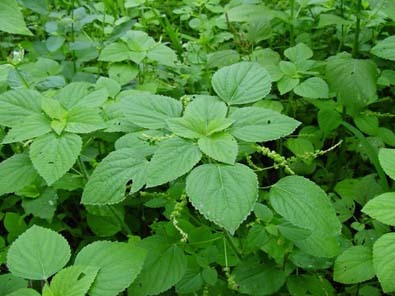 Acalypha lanceolata is included in the Cook Islands database. 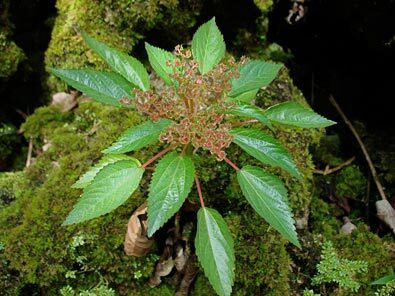 The Acalypha & Laportea species are described in in Art Whistler's Wayside Plants; information about Adenostemma lavenia can also be found in Wagner et al., Manual of the Flowering Plants of Hawaii. (See Bibliography for publication details). See the pages on Māori Ongaonga and Houhere respectively (links above) for information about Urtica spp. and Hoheria. Photographs: Laportea interrupta (c) W. Arthur Whistler, Urtica Australis (c) Jeremy Rolfe, NZ Plant Conservation Network; Hoheria populnea (c) Jonathan Boow, NZPCN, Adenostemma lavenia (c) Honolulu Board of Water Supply; Acalypha lanceolata from hbp.narod.ru; Laportea ruderalis (c) Lauren Gurierrez.